We had been planning a week long trip into the Tobeatic since spring. Our main goal was reach North Bingay Lake as we wanted to see the old growth island that was located there. We had been to the Sporting Lake islands before but had heard that North Bingay may be better. As time got closer to our departure date a planned route had not yet been decided. 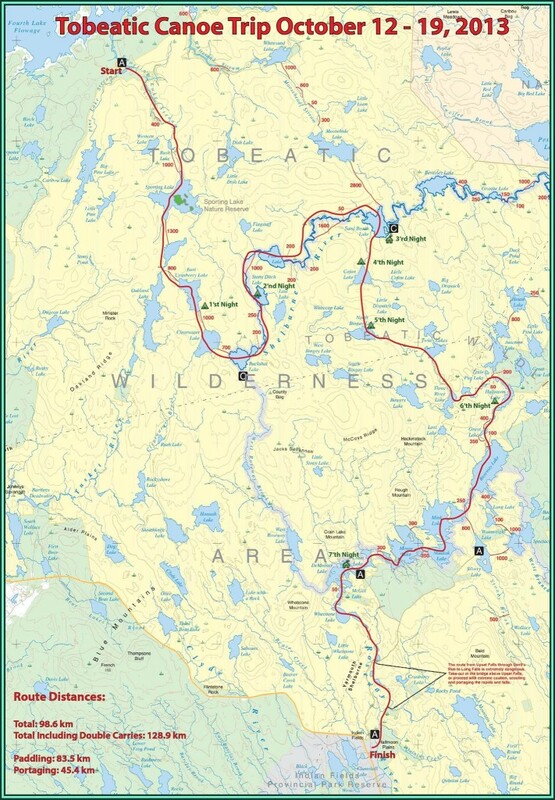 The typical route to North Bingay is from the Roseway River but we had heard there was an old trail connecting North Bingay to the Shelburne River from Cofan Lake but the portage was well over 2km long and not frequently traveled in many years which presented a big challenge. It was decided to try this route and see parts of the Shelburne River we hadn’t seen. So, the planned route was to start at Sporting Lake Stream to Cofan Lake then North Bingay into the Roseway River and down to Indian Fields where a vehicle would be waiting. 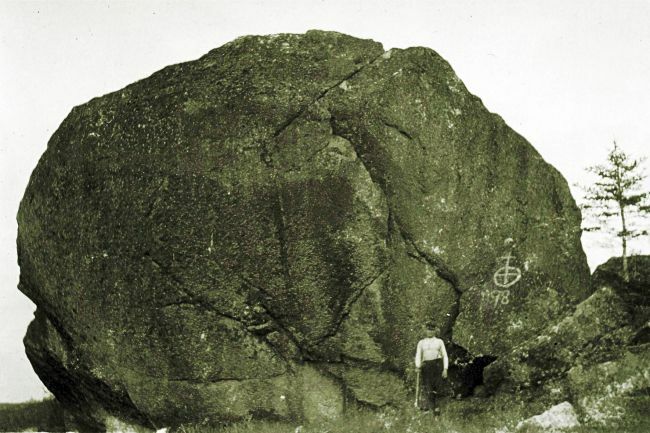 Also, while doing a little research and talking with a few people that travel the Tobeatic, the story of Jim Charles came up and with it an old picture of a person standing next to a large rock that was thought to be where he hid out. 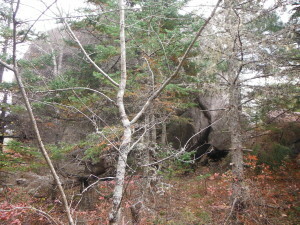 The location of this rock in the picture is known and goes by the name “Calling Rock” which has a cave along side it, and there is also a rock with a small cave in it next to the shore on Sand Beach lake which they call “Jim Charles Rock” both were added to the list of places we had to see. October 12 – We started the day early and were dropped off at Sporting Lake Stream ready for the adventure ahead. Very nice sunny day. Portages into Sporting Lake seemed well traveled and easy to follow. Once on Sporting Lake we stopped and walked around the largest island which has old growth hemlock and always an amazing place to visit. After Sporting Lake the portages are a little less traveled and grown in at parts. We made it as far as East Cranberry Lake where we made camp at a nice campsite at the start of the portage into Clearwater Lake. Sunny all day with little wind but was a chilly/frosty night. October 13 – The next 2 portages (into Clearwater lake than into Buckshot Lake) proved to be difficult and slow going. Once on Buckshot we tried to locate the old wardens cabin that was inland about 500m next to an old portage trail but we were unable to find both and decided to paddle on but return at a later date and try and find it. This day we made it as far as Stoney Ditch Lake and camped at a very nice campsite among the pines along a stillwater. Day was very nice and sunny with little wind, night was frosty. 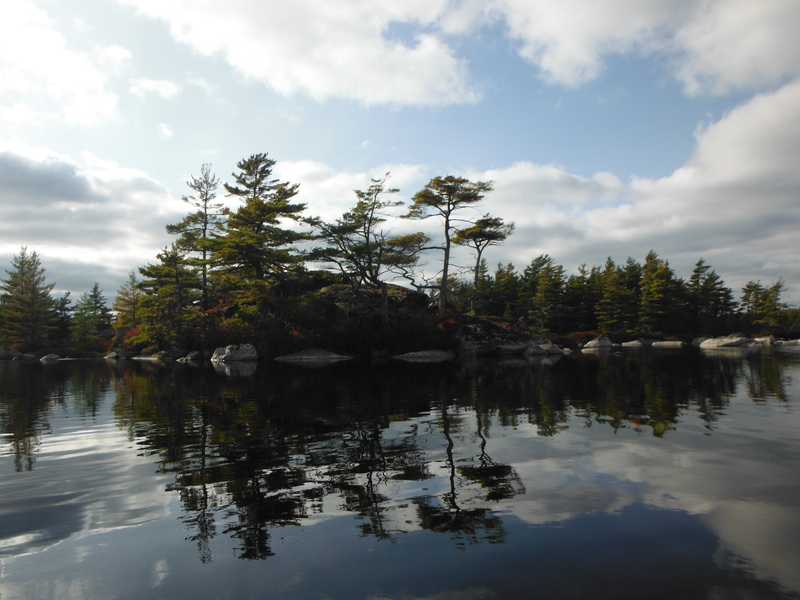 October 14 – Paddled/portaged to Pine lake. We saw old artifacts of what was left of the cabin just before Pine Lake. Then paddled the long still water and portages into Sand Beach Lake. Paddling past the Esker Carry to the short 600m carry we heard something crashing into the woods and someone thought they saw a glimpse of something but unsure what. After a few meters there was the start of the carry and what did we see along the shore but very fresh moose tracks! Confirmed what we had heard minutes earlier but disappointed we had missed an opportunity to see a mainland moose, only minutes if not seconds sooner. Made it to Sand Beach Lake after another sunny day with little wind and were able to witness a beautiful sunset while paddling across the lake to Cofan Cabin. By the time we were done soaking in all the sunset on the lake the sun had set and we now had the challenge of finding the cabin in the dark, but after some searching it was located. Once settled in we had a wonderful Thanksgiving meal and a good night sleep in the cabin. That night we were welcomed by the “Cofan Mouse” who must have been excited to have the company as he didn’t want us to fall asleep. October 15 – Packed up gear and left it at cabin while we walked to “Calling Rock” which is a couple of kilometres from the cabin. Were able to find parts of the old trail that went to the rock and was very interesting to see the old blazes and at some points on the barrens could follow the trail as was still a path in small parts. 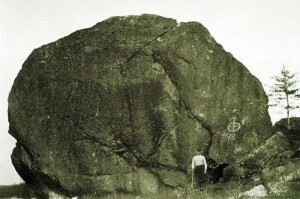 The rock was a site to see in person and no doubt the same rock as the old picture. A cave is along the side of the rock and it is possible to climb to the top if your climbing skills are any good, which ours were not. Tried to recreate the old picture but it proved difficult with all the tree growth. Stayed about an hour then walked back finding more pieces of the old trail and marking all with the GPS. Once back at the cabin we grabbed our gear and paddled back onto Sand Beach lake where we visited “Jim Charles Rock” which is by the lake shore and guarded by 2 Canada geese that didn’t look too happy about our visit. There is a great view of the lake from the top of the rock and also a smaller cave can be found. From there we paddled/portaged to Cofan Lake where we stayed at the campsite at the end of the portage that enters the lake. 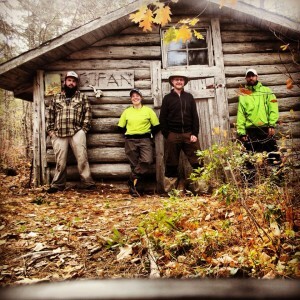 October 16 – We packed up and paddled across Cofan Lake to the portage trail. Little did we know at the time how long before the canoes would see the water again. 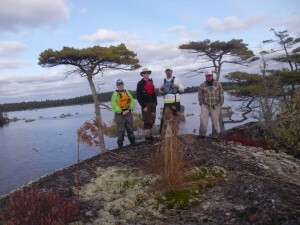 We had received some advice on where to start and had obtained the GPS track of the portage so it was relatively easy to find but without that it would have been very difficult. Once on the trail it was much more difficult than what we were used to and at times there was no trail at all. To make things easier we ended up sending one person ahead with the GPS to find and flag the trail so the rest of us could follow behind with the gear. The old grown over blazes and odd piece of flagging tape proved useful confirming the original trail. It was a rainy wet day and the portage took us a little over 6 hour to complete. The nicest spot being the last 300-400m which was a nice barren with the occasional moose and bear sign. Once back on the lake it was windy and the rain was starting to get heavy. Checked out the North Bingay campsite which looked nice but too exposed to the current weather conditions. Paddled over to the old growth island to have a look and was amazed at the site that in my opinion is better than the Sporting Lake Islands. The trees were bigger and overall appearance was amazing with giant hemlocks with mosses, ferns and Canada yew along the forest floor. From there we paddled around the lake shore looking for another possible site to camp for the night but none were found. At this point all were very wet, cold and tired with no sign of the weather letting up and it was starting to get dark. We decided the best spot to camp was back about 100 meters on the portage trail where there was a stand of pines with open ground and shelter from the weather. Made camp there, made supper, got into dry clothes and all turned in for an early night as was a very long day. Rain/wind continued all night. October 17 – Nice weather returned in the morning. We had been falling behind schedule and knew there was a lot of water to cover today. Paddled/portaged into Twin Lakes, some of these trails were hard to follow and didn’t seem used much. Had lunch at campsite between Twin Lakes and Three Rivers Lake. We were able to bypass some of the portages after this as there was enough water to paddle down or lift over sections. Given our successful progress we made the mistake of trying this with the Two Cup Carry and learned the hard way that we should have portaged this one going up or down stream. We were able to make it to Half Moon Lake and camped on the west side halfway down just as it was getting dark. Nice sunny day with little wind. October 18 – We woke up to overcast skies and before too long rain started. Paddled/portaged to Roseway Lake. Noticed how much better the trails were on the Roseway and how they seem to have improved in the last 3 years. Maybe a good sign of more people getting in and enjoying the Tobeatic. Once on Roseway Lake it started to downpour with a headwind the whole way, which always seems to happen when crossing this lake on the way back. Tried to cut out a hazardous strainer into Mink Lake but were unsuccessful; hoping that the high water will take it out. Stopped by Keatings Campsite on Mink Lake for a snack. Ran the sluce into Skudiak Lake and portaged into Moose Lake. Made it as far as McGill Lake for the night and after a cold/wet day, we stayed in the Molasses Run cabin which was a welcome sight and were able to start a fire to warm up and dry our clothes, we all slept very well that night. October 19 – Sun shining again. We went to try and find the portage from McGill Lake to West Roseway Lake. After a little searching we found it and appeared that it hadn’t been used in quite some time and looked grown in at spots, a possible route for another trip. We were able to run everything to Upset Falls without too many problems, water levels still a little low. Had lunch at Upset Falls. From there ran everything to Indian Fields, carried gear around Mountain Falls but no problems going down with empty canoes. Looks like it could be an exciting piece of water when levels are high. Made it to a waiting vehicle at the Indian Fields airstrip around 2:30. It was a bitter sweet end to our trip as we were all tired and a little glad to be home but at the same time sad that it was over and having to return to the real world again. We had traveled through some amazing country and up to this point was our longest trip at 8 days and 7 nights without seeing another person since we left. Special thanks to Andy Smith for his book “Paddling the Tobeatic”. Alain Belliveau, Mike Parker, Bob Johnston and Davis Bennet for all of the info that helped in planning this trip which certainly made traveling this rugged landscape go a whole lot smoother.